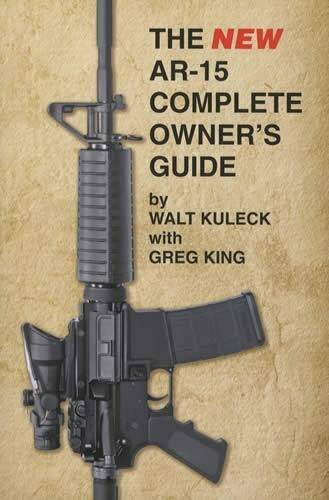 The NEW AR-15 Complete Owner's Guide - How to select, configure, operate, maintain and upgrade your own AR-15 by Walt Kuleck with Greg King. While we’ve brought the content of The New AR-15 Complete Owner’s Guide into the 21st century, the purpose we set out for the original Guide is largely unchanged: to build a foundation for understanding, evaluating and selecting AR-15 rifles, components and accessories. It’s for everyone interested in this, the most versatile rifle system ever developed, whether contemplating one’s first AR-15 or one’s tenth. Because of the AR-15 rifle system’s versatility, we’ll be defining four general areas of AR-15 applications: Defensive Rifle, Hunting Rifle, Competition Rifle, and “Just Plain Fun”! Inevitably, within the Defensive and Hunting categories there will be an extensive range of configurations. We’ll do our best to address the specific needs of the broadest range of users we can. Within these pages you will find a straightforward, uncomplicated approach to AR-15 ownership and use. Based on your needs and desires, we’ll help you think through your configuration and choice of AR-15s. Once you have your rifle, you’ll find useful information to help you operate, maintain and troubleshoot it. So, let’s begin our journey of discovery into the magnificent world of the AR-15! It's the most comprehensive book of its kind on the AR-15. The new book is 6" x 9", Perfect bound with a laminated soft cover, and has 275 pages, and over 400 photographs. Walt got his first gun, a DCM M1911, during the halcyon days of the Eisenhower Administration. His collecting and shooting interests evolved over the subsequent years to encompass US Martial Arms, both handguns and rifles. This interest naturally progressed from the Krags of the 19th century to the M16/M4/AR-15 of the 21st. Walt's books have similarly ranged from the M1 of 1936 to the AR of today. Greg and his brother Eric first encountered Walt via The AR-15 Complete Assembly Guide, which they used to build ARs for themselves and to serve as a similar resource for their friends. This experience led Greg to become one of the author team The M1911 complete Assembly Guide. His enthusiasm for the AR-15 drew him to participate in the project that became the New AR-15 Complete Owner's Guide. Some of the most interesting ARs found in the Guide are the products of Greg's imaginative experimentation.